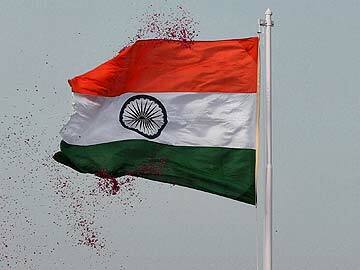 We love our country and we love to flaunt our patriotism especially during Independence Day celebrations. A thoughtful and easy way of showing off our love for the country is to wear shades of the Indian flag. But mind you there are certain rules and regulations to follow. The flag cannot be represented as a portion of costume, uniform or accessory of any description which is worn below the waist of any person. With many options in hand, here are some patriotic ways to give your dress code an Independence Day twist. 1. Keep it Discreet: Wear a ‘bindi’ with your kurta to work. The bindi is arguably the most visually fascinating forms of all body decoration originating in India. Sport some bangles in saffron white and green. They are the right mix of femininity and symbolic of Indian culture. In short, don’t make it a grand gesture. Independence Day is not only about celebrating our freedom but also the customs, the crafts and the essences that make us who we are. Subtle hints of the tri-color are the best way to show your solidarity at work. 2. For an Adventurous look: Deconstruct the colors of the flag for fashion could not attract much criticism. Give your palazzos or culotte an Indian twist. 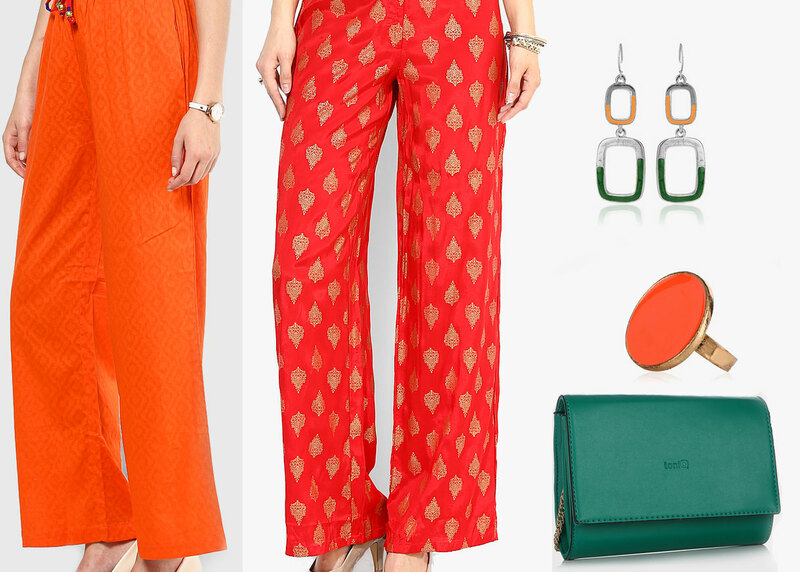 Pair bright orange palazzos or brocade pants with a crisp white shirt. You could wear a bag of solid color to complete the look. You could also color block your outfit. Orange and green, being from complimentary color palettes, makes for a great combination to try out. If you’re feeling lazy, the classic white kurta with a colorful dupatta works the magic every time. Accessorise with heavy silver jewellery and an embroidered ‘jhola’. A Lucknow ‘chikankari’ kurta in your wardrobe comes in very handy on this day. If you are more organically inclined, wear a ‘khadi’ kurta. 3. Saree is the best friend. No better day than this to wear a crisp cotton sari. If cotton is difficult to handle, opt for a silk or georgette saree instead. We absolutely adore how Sonam Kapoor wears the colors in this Manish Arora outfit. Mandira Bedi also draws quite a pretty picture in this beautiful saree with hints of orange and green. We can’t leave the men out can we? 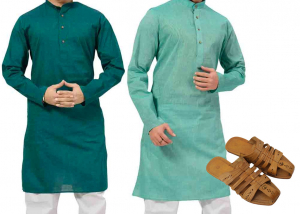 For them, green kurta with white churidar and Kolhapuri chappals work as a wonderful option. Sleek back hair and a big dialled watch could finish the look. Jawahar coats have often been the go-to for men during such festivities. Add a saffron or green silk pocket square and you are dressed to impress. Open hair is often frowned upon in Indian culture. Just this one day, tie your hair into a braid or a bun. Many a experimentation has been done with halo braids and waterfall braids. These go wonderfully with all Indian face shapes. Mix it up with some hair brooches from your mother’s wardrobe. Or better still wear a ‘Gandhi topi’ with your outfit. James Ferreira gave us some wonderful looks in his A/W 2012 shows. Think you would rather stay off sporting the colors of the flag? Wear the ‘tiranga’ brooch or pin the flag onto your outfit. Men, wear a tri-color tie-pin if you cannot wear a kurta on this day. 1. Some of our politicians may have invited controversies for using the tri-color as face wipe during the Yoga Day celebrations. Using your tri-color as your scarf is acceptable but to pat yourself dry? A BIG NO. 2. Any hint of the flag (the three colors together) waist down. 3. Making a costume out of your outfit. Nobody wants to see a flag strut down the road. We would rather see it soar high in the sky. Wear the colors of our nation with pride and elegance. Remember, however you choose to show your love for the country, it is just a visual representation of it. Patriotism comes from the heart. And we salute the martyrs who laid down their lives for the country. Previous Is it Worth Buying, When Gold is Falling?